NORDO News - Aviation Unedited: WHAT DO THOSE 3 CONES MEAN? We feel that there are a few things that need to be stressed to those using our airport. This spring, we've seen regulars and first timers all make a mistake that could cause serious problems for those involved. The mistake refers to the old saying about runway behind you. We all know that it does you no good; so please keep on reading. Recently, we had a pilot who did not use ALL of the available runway and because of this and the fact that he departed downwind, he still had his wheels on the ground for several hundred feet into the cornfield stubble to our North. And then, because of a misconception about grass runway markings, we had another pilot who shut down in the middle of the runway to have a picnic. Therefore, we would like to discuss the meaning and purpose of the two sets of three cones that you see toward each end of the runway. Do you know what they mean? If you think it marks the end of the runway, keep reading to find out the 'real' story. . . Here at Lee Bottom, the runway is 4080' in length from end to end. That is from the Trees on the South end to the Field of crops on the North end. Down each side of the runway are white cones that mark the width of the runway, which is 100'. These are laid out similar to paved runway lights which are located every 200' along the length of the landing area. However, the astute pilot will notice that at each end there are two sets of 3 white cones. These are NOT the end of the runway. THEY ARE DISPLACED THRESHOLDS. For runway 36, the set of 3 cones is 800' from the South end of the runway. For runway 18, you'll see the set of 3 cones is placed 200' from the end of the runway. At the South end the displacement is for trees, and at the North end it is for crops grown each year in the field next door. Let's review what a displaced threshold is all about. Very simply, the displaced threshold marks the place where the runway starts for landing purposes. However, the area prior to the two sets of three cones is available for take-off and the area beyond the two sets of three cones at the far end is available for landing. Here at Lee Bottom, due to the layout of the surrounding land, when you are taking off to the North, you have to pull onto the runway near the two sets of three cones and back taxi to the South to get all of the available runway. This ending of the taxiway thus seems to cause some pilots to pull onto the runway and take off from that point. If you do this, you only have 3200' of runway ahead of you. So remember, runway behind you does you no good. Unfortunately, although it would be nice if there were nothing on the planet that would scratch a beautiful old airplane, markings are required for certified runways. Additionally, we have also found that it is generally better to give people a way to see the runway so they don't go four wheeling. 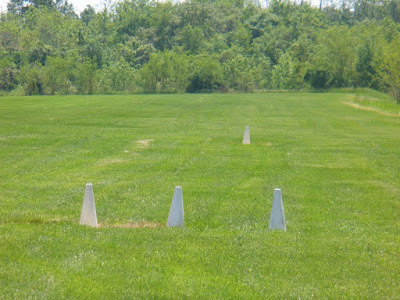 Therefore, expect to see our rubber white cones for the duration of our stay.